Ragnarok (a.k.a. Rocky, The Rok, Rocketman, Rock Star, Busted) is a 4-year old black sable ferret, which just means that his fur is very dark brown. When he was a kit, he had a stronger T-mask; he has lightened up a bit as he ages, though not to the extent of a roan. 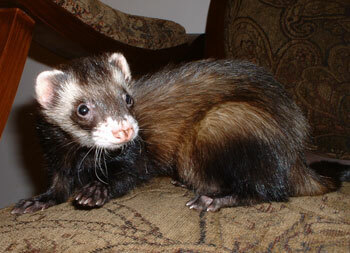 Although Rocky was a pet store ferret, he was not from Marshall Farms, and has no identifying tattoos at all. The store could only tell us he came from Canada. At any rate, The Rok was still neutered at an early age, a fact which we believe stunted his growth significantly. 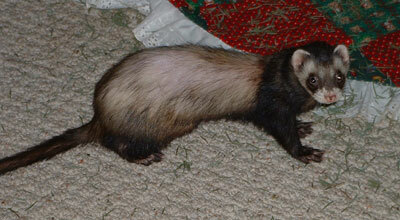 He still has outsized limbs and tail, which makes him a very lanky ferret, but Rocky could have been a Big Boy if he had had the chance to really grow up. This past winter, at the age of 3.5, Rocky began to lose fur in patches on his back, and become more vocal and aggressive, particularly with the girls. We were suspicious, and the vet confirmed that he was developing an adrenal gland tumor, a common disease among early neuters. Although at these early stages he was in no pain, eventually the tumor would cause a fatal overload of hormones. By the time he went in for surgery, Rocky’s skinny little bod was mostly bald, from hair loss caused by the disease, and from having been shaved for tests. I felt like crying every time I looked at him. 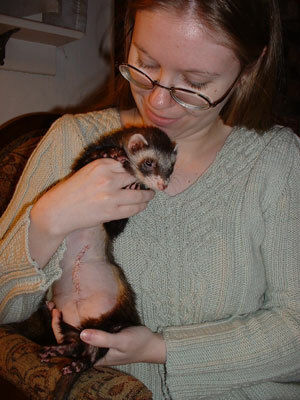 However, the operation, though one of the more complicated types of adrenal surgery (a ferret’s right gland is wrapped in the vena cava), was a complete success. Within a few months, Rocky’s hair began to grow back. Now he is fat, sleek, and sassy again, and very happy to be able to play nicely with his buddies. Tangential note for knitters: See that sweater I’m wearing? I made it.